Taxpayers face a skyrocketing bill to compensate passengers on Southern rail for failed services after ministers today announced more than 84,000 are in line for payouts. As reported by Transport Network, any compensation payment to Southern passengers ultimately comes out of government coffers due to the specific franchise arrangement with parent company Govia Thameslink Railway (GTR). The Government is already set to foot a £38m bill for GTR's disruptions, which have also been significantly affected by union actions. This figure could rise by more than £10m. At the same it was disclosed that rail fares will increase by an average of 2.3% nationally next month. Labour shadow transport secretary Andy McDonald told Transport Network: 'Taxpayer subsidies already line the pockets of train operating companies, and now we’re being asked to fork out again to compensate passengers for Southern’s incompetence. 'It seems the Tories are prepared to do anything to defend the country’s worst rail service, including raiding the public coffers for this Christmas sweetener. 'The announced compensation won’t come close to covering all those who’ve suffered Southern’s abysmal service and even those who do benefit will see their compensation wiped out by next year’s 1.8% fare rise [as announced by GTR for Southern services]. 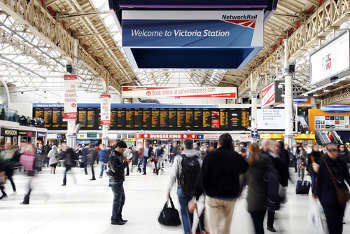 The Department for Transport (DfT) said more than 84,000 passengers would be able to claim a refund for the equivalent of a month’s (4 weeks) travel. Annual season ticket holders will be able to claim a refund against their 2016 ticket while customers claiming against quarterly, monthly or weekly tickets must have bought travel for at least 12 weeks from 24 April to 31 December. Officials said the payment was to ‘recognise the particular hardship’ of those who have suffered for long delays, cancellations and disruption caused by ‘Network Rail track failures, engineering works, unacceptably poor performance by the operator and the actions of the RMTunion’. However, Govia Thameslink Railway (GTR) told Transport Network that under its management contract, it hands all income to the DfT, which therefore bears the revenue risk, including the cost of compensation. It emerged this week that GTR is projecting a revenue shortfall this financial year of around £38m from the impact of poor performance and a reduced timetable introduced in July. GTR told Transport Network that that figure does not include the new compensation. The company was not able to provide an estimate of the additional cost. However, an annual rail only season ticket from Leatherhead to London currently costs £2,356, which would provide a refund of around £180. If this were the average refund, the overall cost would be around £15m. GTR said that where it has their details, Southern will contact the majority of eligible customers directly. A website is being set-up to enable other customers to apply online. The announcement from the DfT co-incided with a separate announcement from rail operators that fares will rise by an average of 2.3% from 2 January. It was disclosed in August that regulated fares would rise by 1.9%, which means that unregulated fares are again rising faster.